The Windcube is the reference remote sensor in the wind industry, providing accurate wind measurements up to 200 meters. Developers, power producers, consultants and manufacturers have selected it for their onshore and offshore projects – from energy yield assessment to power performance testing and optimisation. Standalone, or in combination with traditional meteorological masts, a mobile Lidar is ideal for providing bankable data to all stakeholders during energy yield assessments. An analysis of return on investment found that the use of a Lidar can save millions in equity by reducing uncertainties. In time-constrained projects, its fast and hassle-free deployment allows measuring right away and capturing additional measurement periods. Once the turbines have been erected, characterizing turbine performance is key to profitability, from detecting underperformance at commissioning to verifying an asset before refinancing. With its added measurement capabilities and low cost compared to an IEC mast, the Windcube is already proven to be a suitable tool for turbine characterization. Projects risks vary from site to site, depending upon wind farm size, environment and site complexity. In forested and mountains areas, often referred to as complex terrain, air flow is distorted by the local topography which can lead to bias in wind measurements for both anemometers and remote sensors. The magnitude of the uncertainty depends on the complexity of the flow and also the sensor itself. For the Windcube, the wind flow around complex terrain could potentially induce errors in wind speed reconstruction algorithm, due to the flow homogeneity assumption in estimating wind speed and direction. The embedded flow correction model, FCR (Flow Complexity Recognition) combines hardware and software innovations which enable the Windcube to provide highly accurate, bankable data in all terrains types without the need for any post-processing or post-correction. Its performance was tested and validated in various scenarios by industry experts. For instance, TR6 guideline agrees the Windcube can entirely replace a met mast in simple and in complex terrain with the FCR. In offshore environments, the installation of offshore met masts on large and heavy platforms requires lot of expertise, qualified resources, and complex planning. This costs millions and is dramatically time consuming in a wind farm project. The reduction of capital costs required for offshore energy yield assessment is a critical challenge for offshore wind industry. A Lidar remote sensor integrated on a stable platform or a buoy is currently the most flexible and cost effective solution to accurately measure the wind components and minimise the risk of underperformance. Designed specifically for operation in marine environments, the Windcube is a highly reliable solution in complement to or replacement of traditional met masts for any stable or moving platform. 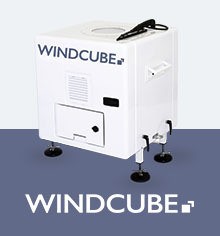 With more than 50 offshore deployments worldwide, the Windcube is used in various applications from early stage for prospecting and bankable resource assessment to site suitability measurements and power performance verifications.